Hello October! Why the heck did you have to sneak up on me like that?! It seems as if time flies even faster when you have a little one! Our son is 2 going on 12! 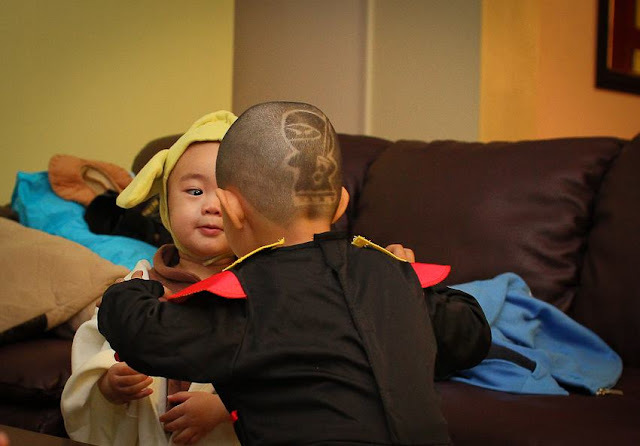 Our photos from Halloween of last year gets me a little choked up! He was still my baby back then! Now he tells me that he is NOT a baby anymore. He is a BIG BOY. His Daddy's big boy. Here's my baby Yoda. It was his first "trick or treating" experience. He kept up with the bigger kids and had a great time. This year his wants to be Buzz Lightyear from Toy Story. I was kind of hoping that he just might want to be a Ninja! He would fit nicely in his cousin's costume from last year! Nope. He definitely doesn't want to be a Ninja.... So Buzz Lightyear it is! Have you already picked up Halloween costumes for your kids? Or am I the only one who hasn't yet? His haul: Not bad for a first timer! NOTE: He didn't eat any of this candy.. All he had was a Yummy Earth Organic Lollipop, pictured at the top of the post. I hope that you all have a safe Halloween! @ReviewsSheROTE Pamela R Awesome! You're all set! @Czjai Reyes-Ocampo Sounds like you are all set too :) Are you going to dress up as well? Now who has already bought candy?! Adorable! Yes, we bought ours early. I can't stand waiting until the last minute to get them. My daughter changes her mind a lot, so I am making a back up costume for her just in case too. Love that last pic! I'm on the hunt for a shark costume. I don't have any idea why he chose a shark, but he has his heart set on it. Have fun! He's sweet! And his cousin's hair was bangin' last year. Every year, I come up with an elaborate plan to make the costumes...and sometimes that works. Hopefully this year will be one of those times. The whole family is going to be Where the Wild Things Are. My 9 month on Max will be Max of course. My 4 year old Simon is putting up resistance. He thinks he's a T-Rex (for real) and therefore will dress as a T-Rex. No, I haven't bought any of the supplies. Looks like his bottle is still the best! It's so fun when they get 'into' trick-or-treating...My kids are teens and the girls are already getting their costumes ready for our family party! Oh my word. 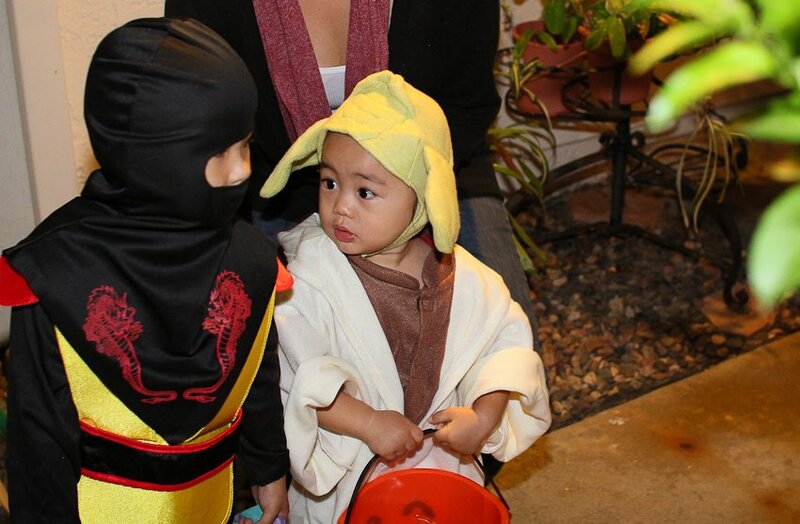 If that little Yoda isn't the cutest thing ever, I don't know what is! 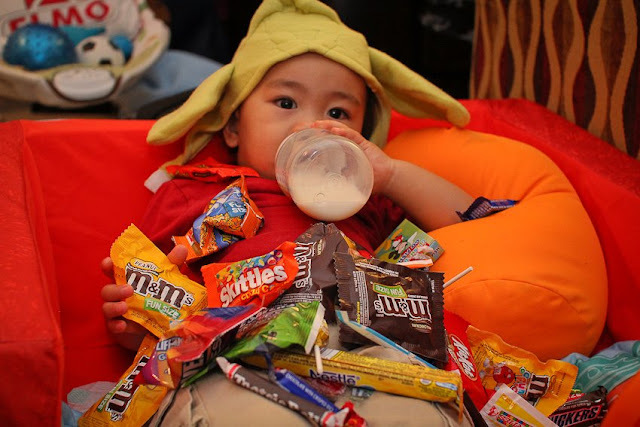 How cute is that Yoda costume? I can't even begin to think about the upcoming holidays. I'm still trying to get used to the idea of the kids being back in school. Does life ever calm down? we just picked out costumes for our 2 year old and her 6 months old sister! This year the oldest one will be able to say "treat or trick". last year she was just sticking out her bag and barely saying "thank you" if she got some candy :) but it was soooooo cute to watch her doing it! this year she'll have much more fun! 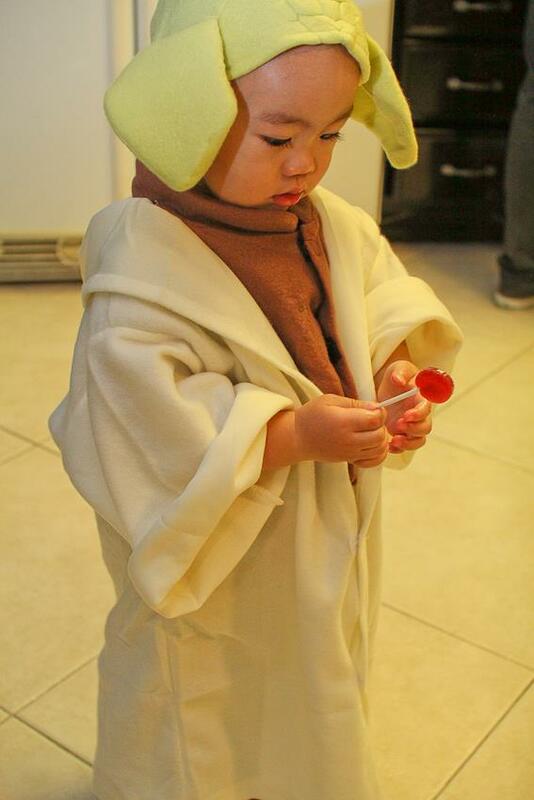 your Little Yoda looks so CUTE!